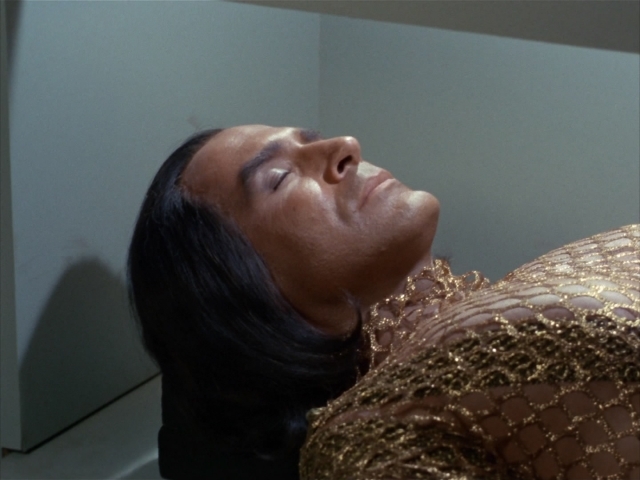 Netflix incorrectly classifies Star Trek TOS “Space Seed” as a prequel to the Wrath of Khan. That is like saying Batman Begins is a prequel to The Dark Knight. It isn’t a prequel if it was made first. Jack B Nimble: Somebody airbrushed that ship. The viewscreen from the main bridge. Jack B Nimble: We’ve discovered another patch of empty space. OghmaOsiris: They’re coming up on empty space fast! Jack B Nimble: The ominous music should have tipped them off. Keen: They may as well have shown Dr. Evil on the viewscreen. OghmaOsiris: This optical illusion I’m looking at tells me there’s a sensor analysis. Jack B Nimble: They must have been geniuses to interpret all those flashing lights. TangoOversway: Believe it or not, at that time, the controls seemed really space-shippy. TangoOversway Picard would have sent Riker over by now. Archer would have just hopped in a shuttle and gone immediately. Jack B Nimble: Ohura was eaves dropping. 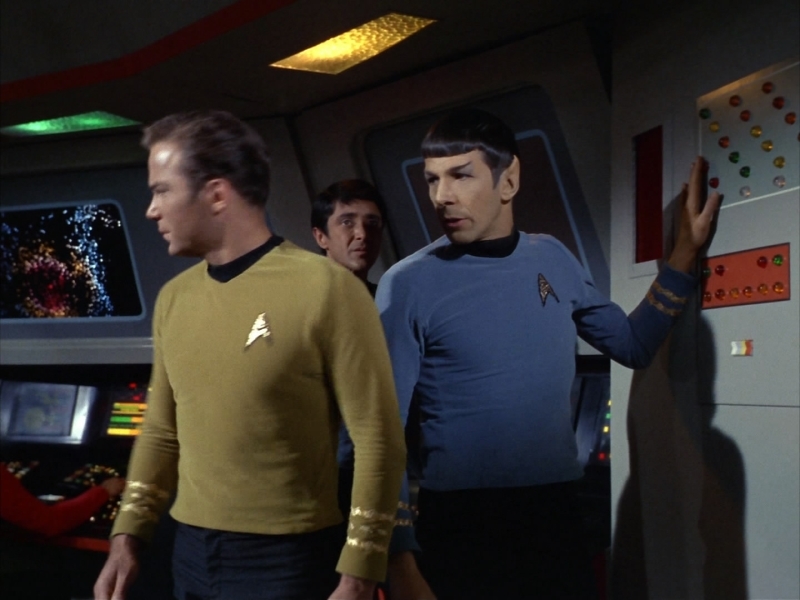 TangoOversway: And now we have the Vulcan/human logic debate McCoy just loves. KIRK: Oh, I’ll need somebody familiar with the late 20th-Century Earth. Here’s a chance for that historian to do something for a change. What’s her name? McIvers? Jack B Nimble: MacGuyver? She is going to build something amazing. Keen: Do they just keep her in a closet? OghmaOsiris: Woman in a red shirt. She’s gonna die. TangoOversway: Now taking bets on whether McGivers dies. Keen: First she’ll get pregnant and then she’ll die. This was the 60’s. The landing party explores the Botany Bay. Jack B Nimble: Scotty is a great engineer, out of 80 buttons on the panel he found the light switch. The ship is found to be full of sleeping passengers. Jack B Nimble: This space ship only has beds. It is a space ship of ill repute. OghmaOsiris: Is he wearing gold chain mail? 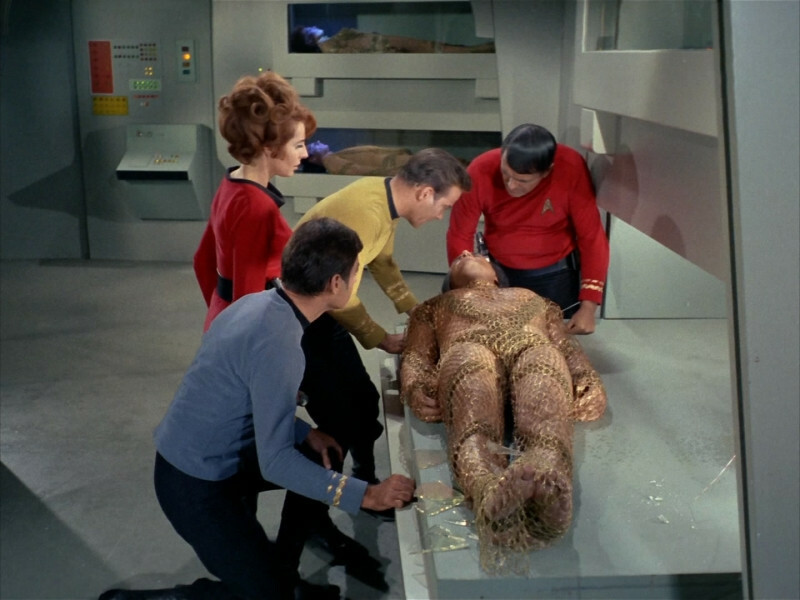 With the vital signs failing, Kirk attempts to rescue the sleeping man. TangoOversway: We can’t figure it out — just break it, Jim! OghmaOsiris: How many captains does it take to screw in a light-bulb? Jack B Nimble: Negative captain. just the one large blinking green light. KIRK: Lock in on McCoy’s beam. He’s transporting back with a casualty we discovered here. TangoOversway: Ricardo Mantalban in fishnets. Keen: I think Leelo from The Fifth Element wore more than Kahn. SPOCK: If you’re suggesting this was a penal deportation vessel, you’ve arrived at a totally illogical conclusion. Jack B Nimble: Stupid illogical Kirk. OghmaOsiris: Seriously, what does Spock do?? 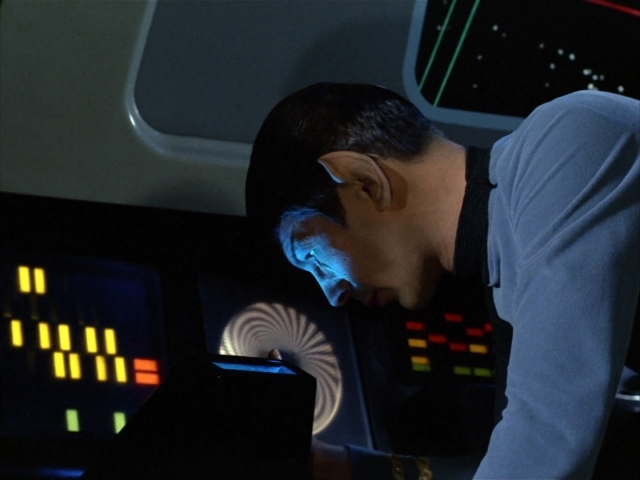 Jack B Nimble: Spock uses the white and black wheel to hypnotize himself. MCCOY: No, I’m good, but not that good. There’s something inside this man that refuses to accept death. Look at that. Even as he is now, his heart valve action has twice the power of yours and mine. Lung efficiency is fifty percent better. 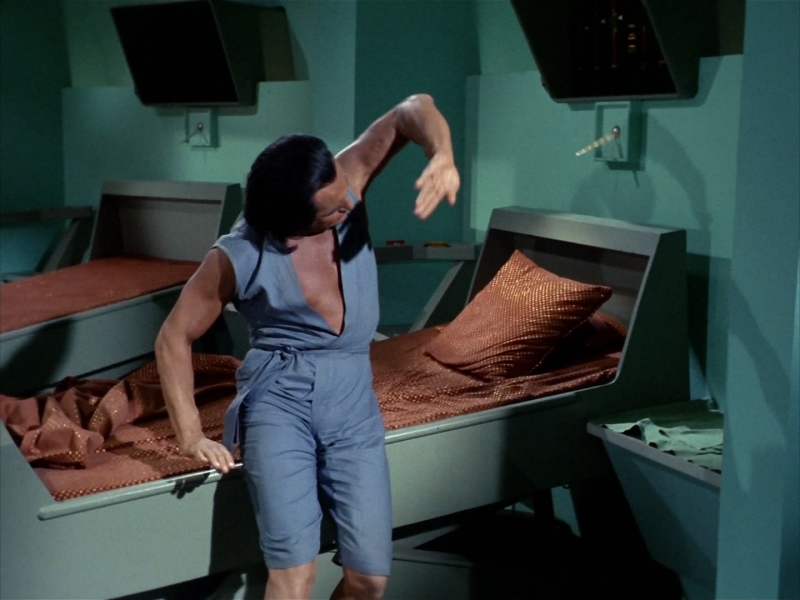 Jack B Nimble: Even in sickbay his shirt is open. His chest must need a lot of air. TangoOversway: I like the ginger in this episode a LOT more than the ginger in the last one. Jack B Nimble: All redheads are traitors. Khan awakens in sickbay and begins to exercise (or something). 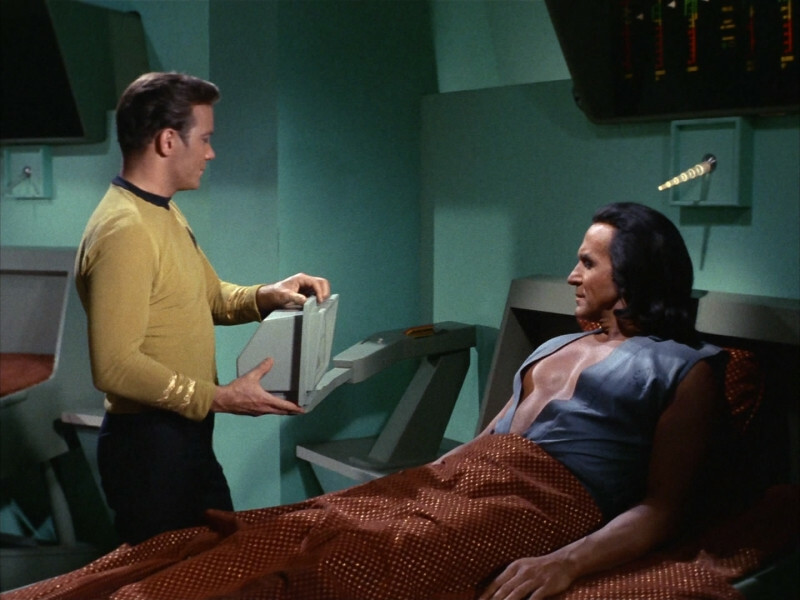 Keen: Even in the 2300’s, hospital gowns show too much. OghmaOsiris: Does he have a native american mullet? 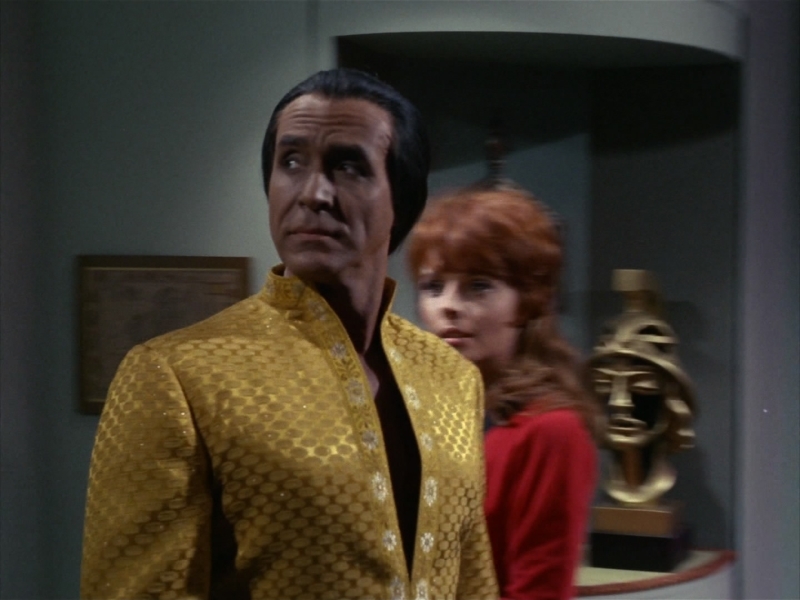 Khan hears someone approaching, and grabs an antique scalpel from a display case. TangoOversway: Never saw that display case before or since in any episode. Keen: What the [expletive] is that wall display?! 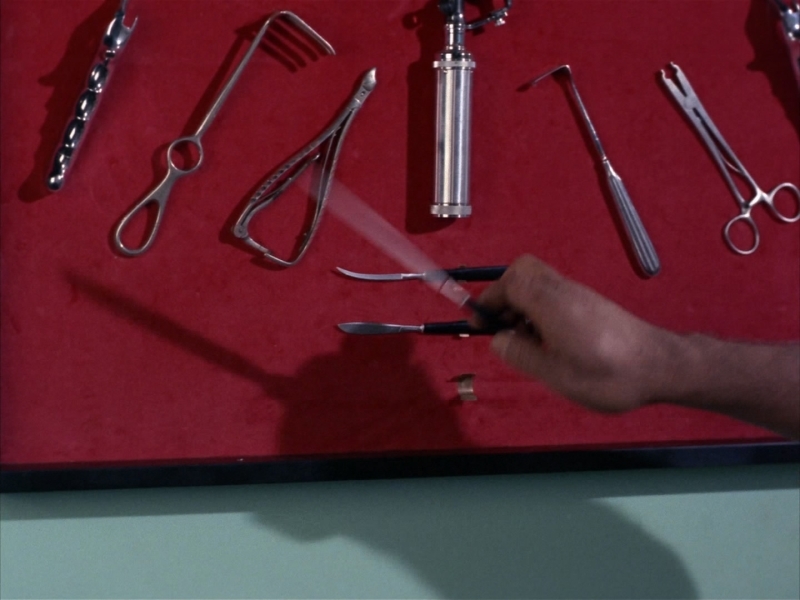 Keen: You show off your torture implements like that, not your medical equipment. 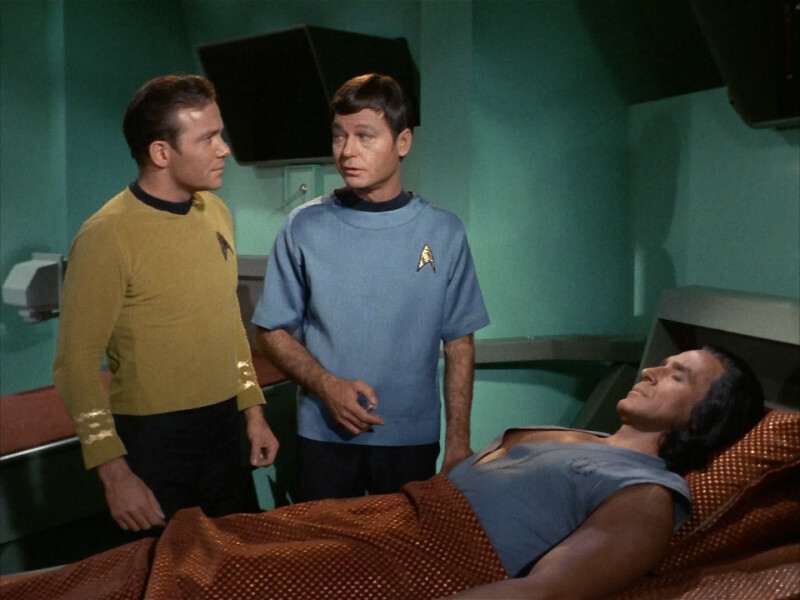 McCoy enters sickbay to examine his patient, and discovers he is awake. MCCOY: Well, either choke me or cut my throat. Make up your mind. TangoOversway: Odd how it’s there just when Kahn needs it. Old surgical instruments. Jack B Nimble: McCoy is pretty brave. Keen: And now McCoy’s captain obvious. OghmaOsiris: Does McCoy wear eye shadow? 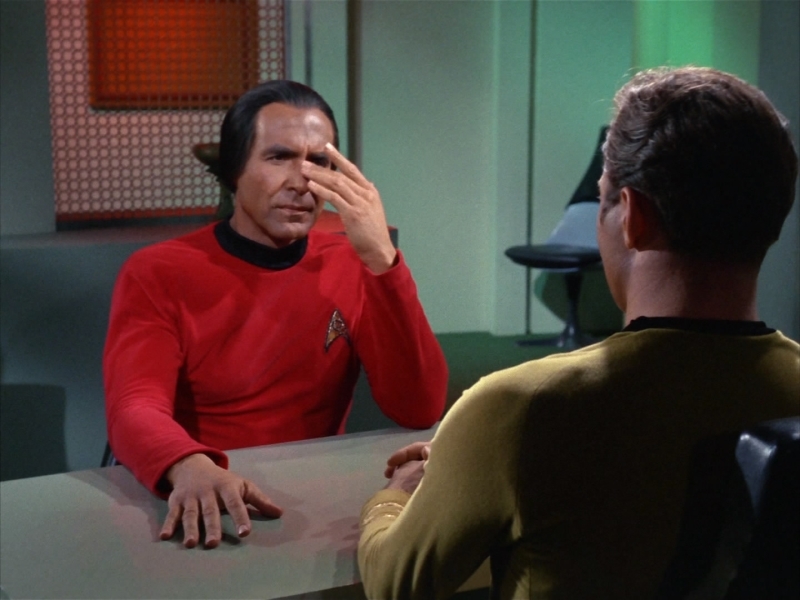 Kirk questions Khan, who claims he is fatigued. 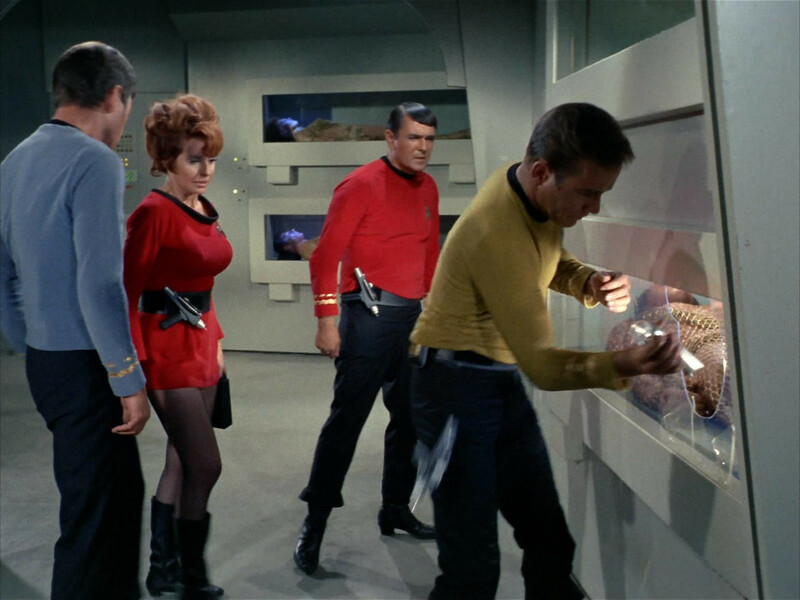 Kirk gives him access to the modern technical documents about the ship. Keen: Why’s there a [item] sticking out of the wall? Jack B Nimble:It is a reading light. TangoOversway: That’s a scanner for the medical readouts above them. Keen: Men had better hair in the 60’s. At least Kahn did. 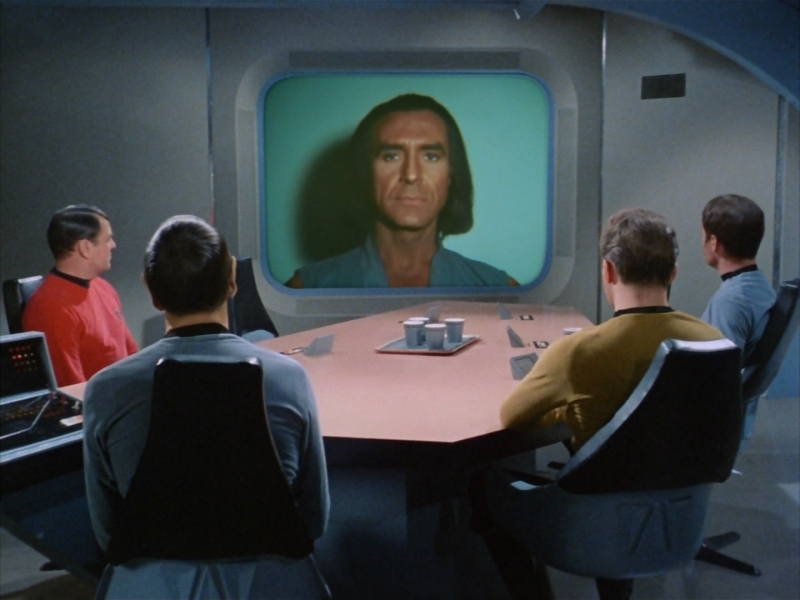 OghmaOsiris: I want Kirk’s hair. Jack B Nimble: Kirk suspects he is dangerous but still gives him technical specs to his ship? McGivers cannot help but be attracted to Khan. Khan explains his position on governments and power. OghmaOsiris: So, Kahn was a communist? TangoOversway: No, he was a tyrant. Jack B Nimble: Benevolent tyrant. Jack B Nimble: I would think women would be afraid to sit down in those skirts. Khan Noonien Singh, professional player. OghmaOsiris: Where did that mirror come from?? 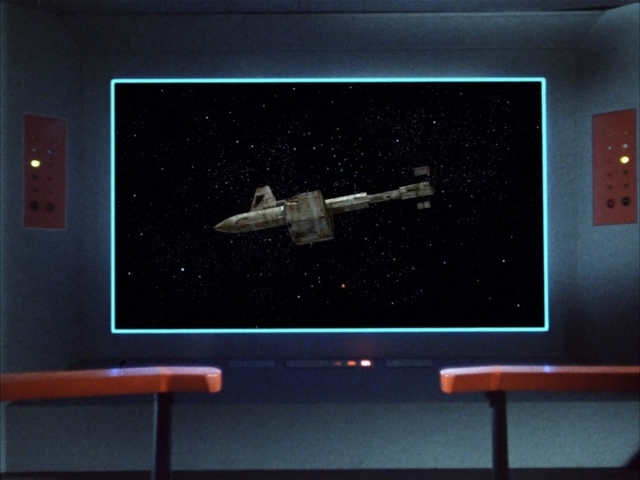 TangoOversway: They took it off the bridge, from Uhura’s control panel. Jack B Nimble: Mirrors spontaneously appear and disappear throughout the ship. It is an old problem of the Consitution class starships. 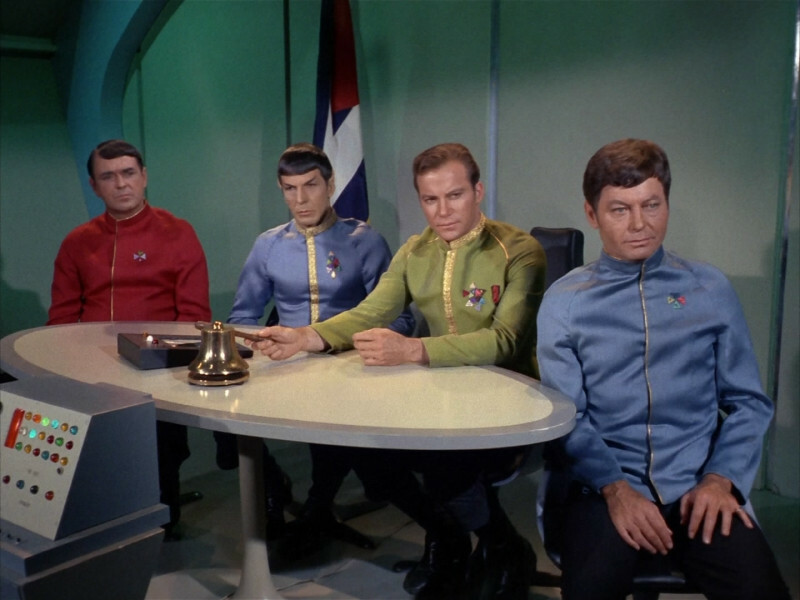 McGivers insists that Captain Kirk and the senior staff dress their best for a dinner with Khan. 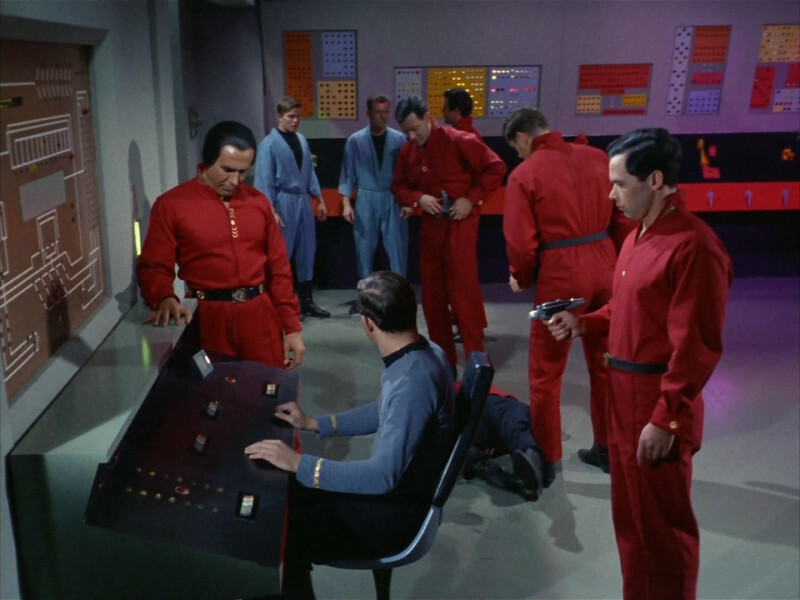 Jack B Nimble: Those are some hideous dress uniforms. 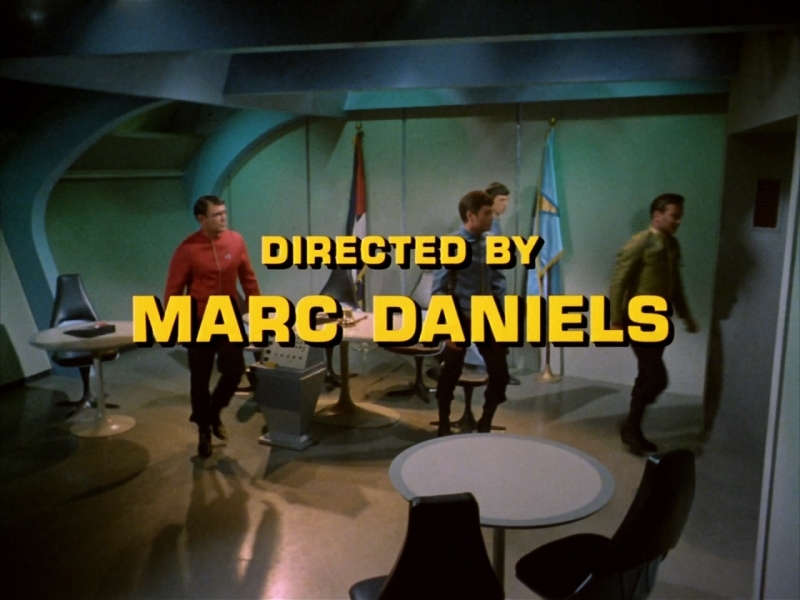 TangoOversway: Notice Checkov, who recognized the name “Botany Bay” is nowhere to be seen in this entire episode. 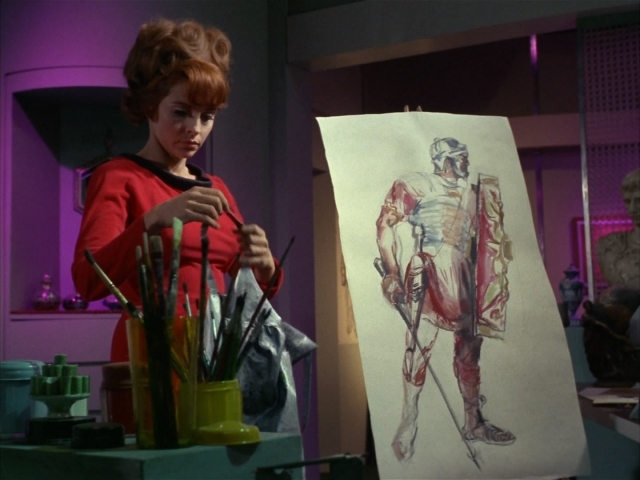 TangoOversway: But you do get to see Scotty’s legs in a dress uniform! Khan and McGivers discuss the past and present. Keen: Is he wearing shrinky-dinks on his chest? 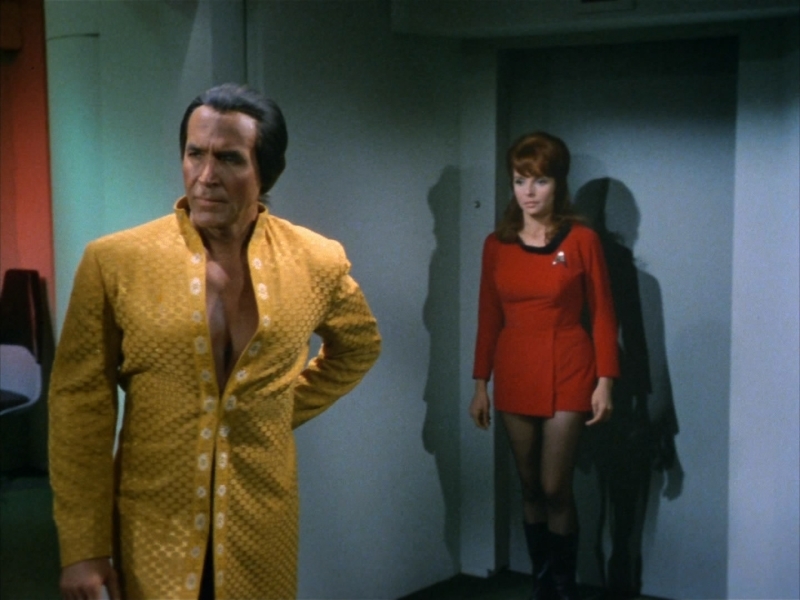 Jack B Nimble: They don’t make a shirt for Khan that closes in the front. Keen: They can’t find a shirt that could contain those magnificent pecs. Before heading to dinner Khan woos McGivers into a kiss. TangoOversway: And I can tell you what censors would have said about that kiss. Keen: Would they say ‘More!’? The senior staff entertains Khan. After some pointed questions from Kirk, Khan once again says he is too fatigued to continue. 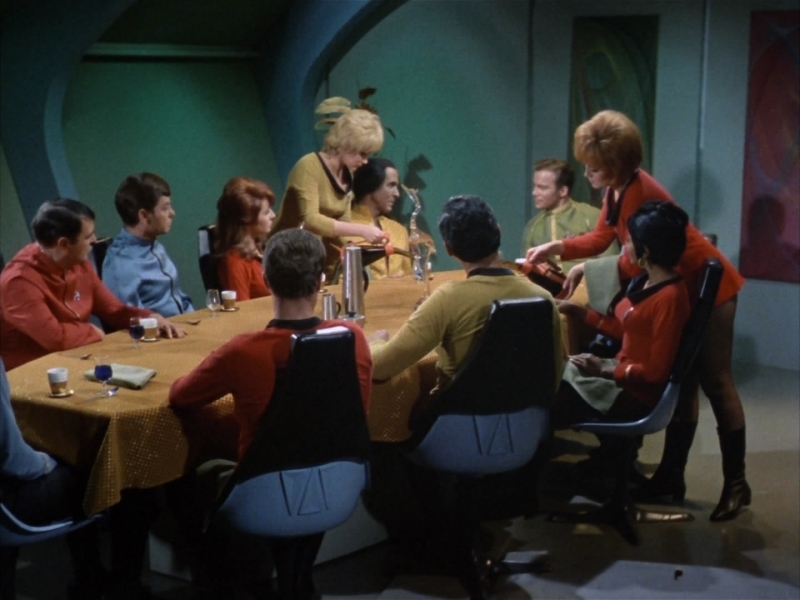 Jack B Nimble: Was that Romulan ale? Khan is constantly fatigued. TangoOversway: He’s a Earth war criminal — and they’re not putting him in the brig? Jack B Nimble: He is a man of weak constitution. OghmaOsiris: No no no. Romulan ale is illegal! TangoOversway: Rule #1: Kahn Lies. Keen: He’s not a space criminal, so he’s fine by them. Back in Khan’s quarters, McGivers visits him. TangoOversway: I’ll bet he’s not fatigued now! TangoOversway: Love that profile shot — he was posing so she could paint his picture and put him on a dollar bill for his new government. MARLA: I’ll stay a little longer. Jack B Nimble: In Augment tradition they are married now. Keen: Kneel before Zod. Wait, wrong show. Spock is able to dig up some information on Khan’s past. Keen: Looks like Powerpoint sucked in the 60’s too. OghmaOsiris: So, Kahn was Hussain? 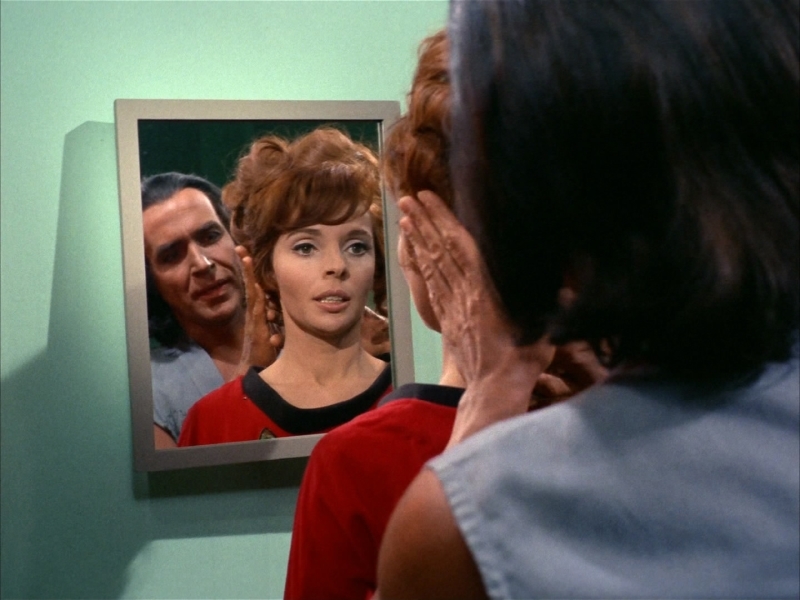 Spock is able to dig up some information on Khan’s past, everyone reaches the same conclusion about Khan. 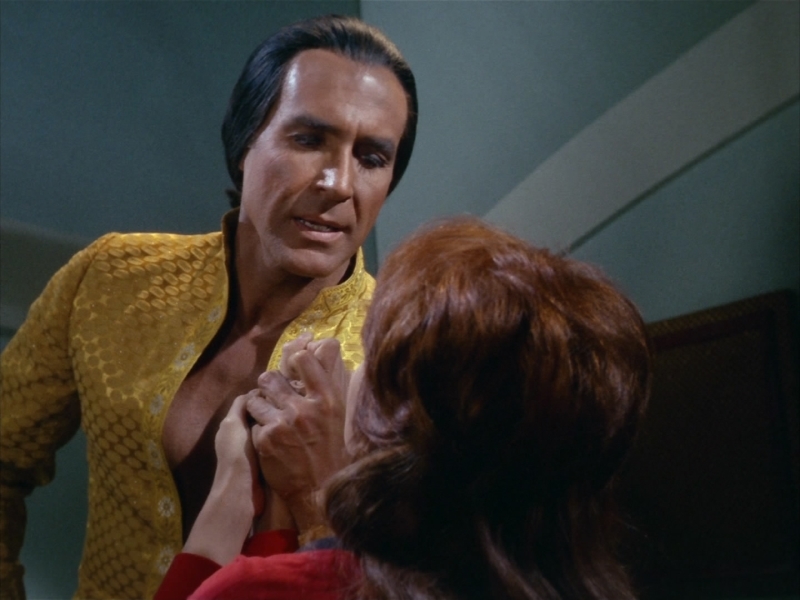 Jack B Nimble: Khan is a redshirt. He isn’t going to make it. 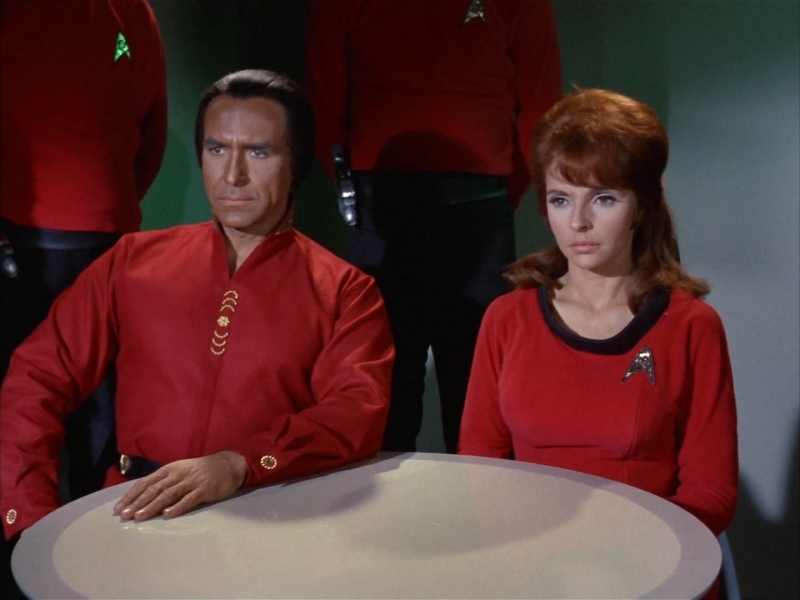 TangoOversway: Kahn’s in a red shirt. He’s going to DIIIIEEEEE! Keen: Haha, they found a way to defeat Kahn. They put him in a red shirt! OghmaOsiris: Hey hey hey! 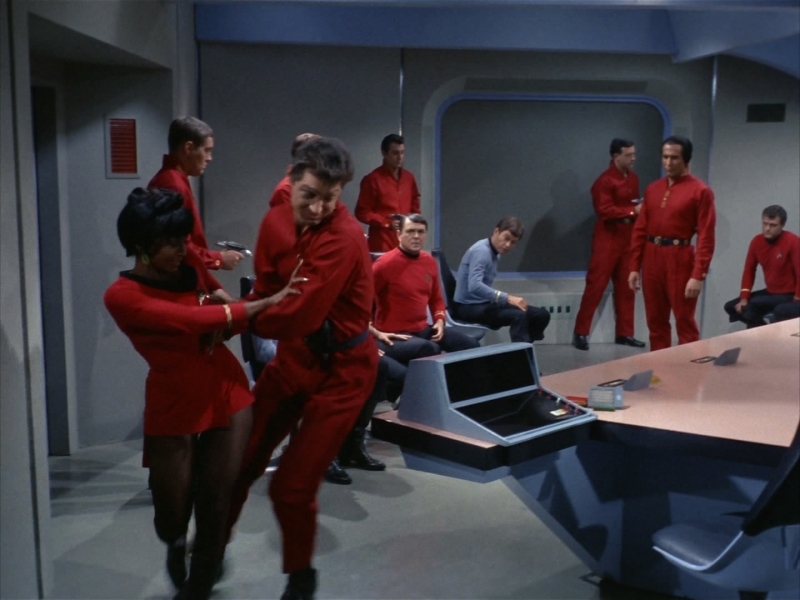 Kahn’s in a red shirt! 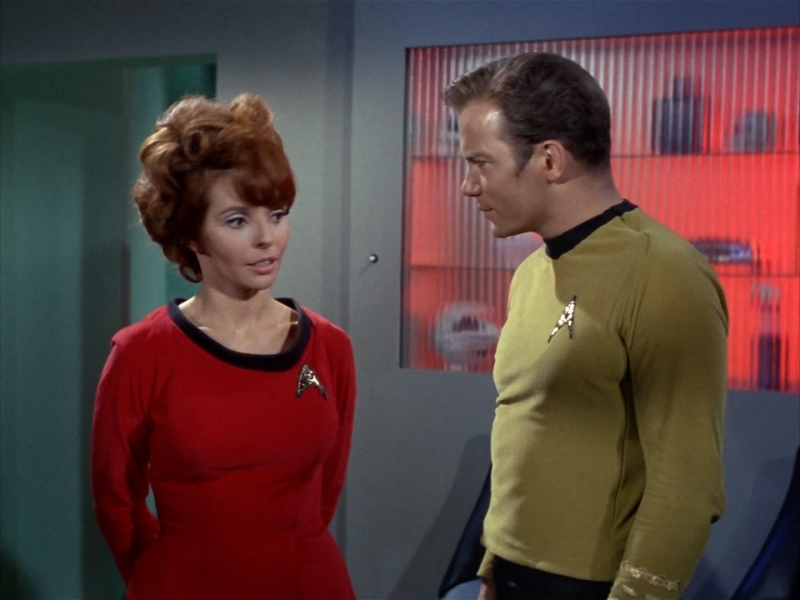 Keen: Color-blind people think green shirts die on Star Trek. Kirk contronts Khan about his past. OghmaOsiris: So, is Kahn Spanish? Native american? Indian? what? TangoOversway: The actor was hispanic (I think Mexican). Khan is confined to his quarters, but quickly escapes. 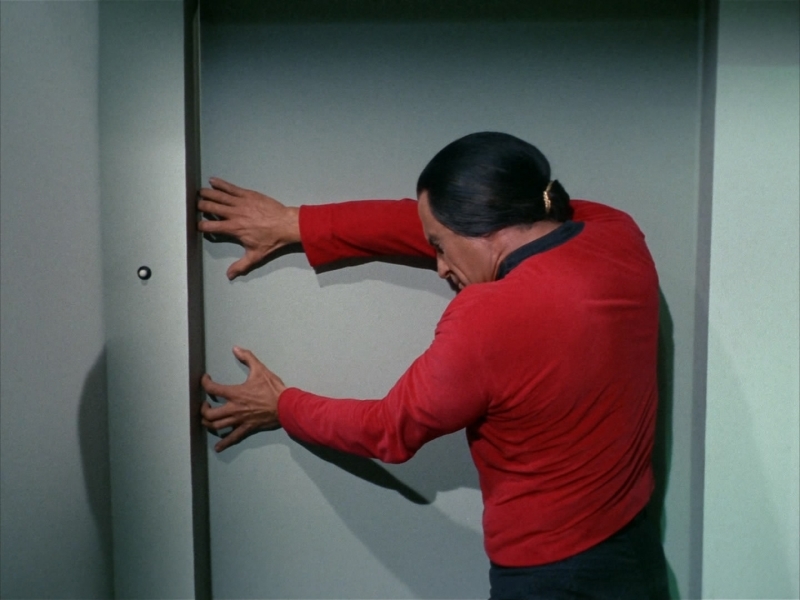 Keen: Why’d Kahn going through the door, all he had to do to break out was punch one of the cardboard walls. 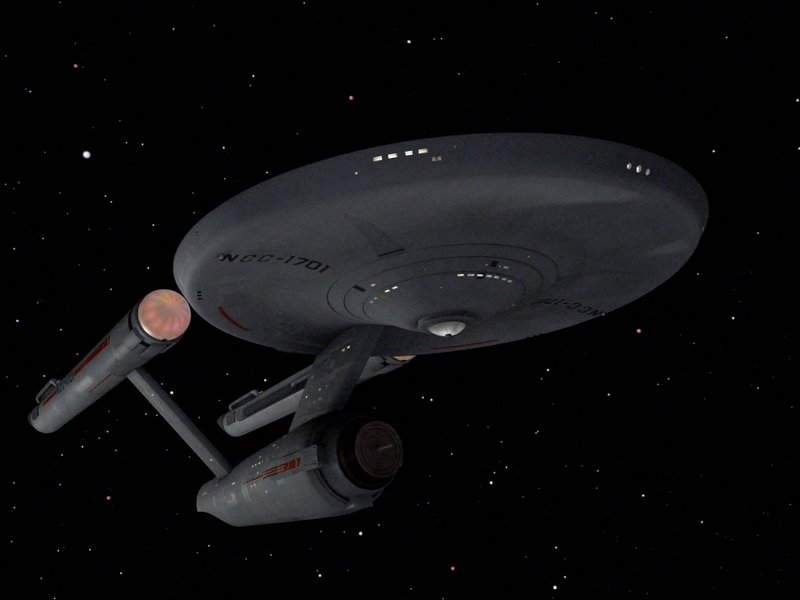 Khan, with the assistance of McGivers, transports back over to his ship, which contains his remaining Augments. TangoOversway: One guard, with his back to the door? 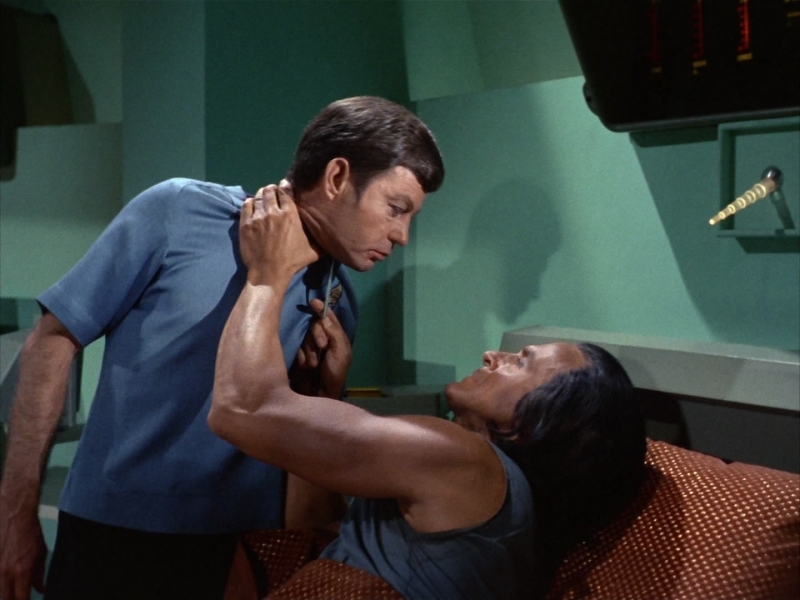 Jack B Nimble: Khan has already mastered the Vulcan neck pinch. TangoOversway: That’s not Lt. Kyle, so they can kill him. Khan awakens the rest of his crew. TangoOversway: She looks a LOT better in fishnets than Kahn. 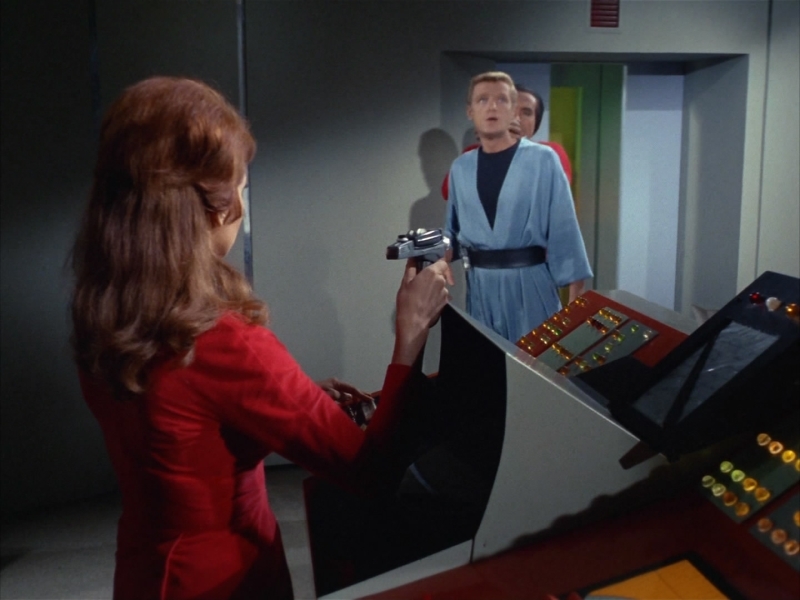 On the bridge, Kirk receives a security alert that Khan has escaped. 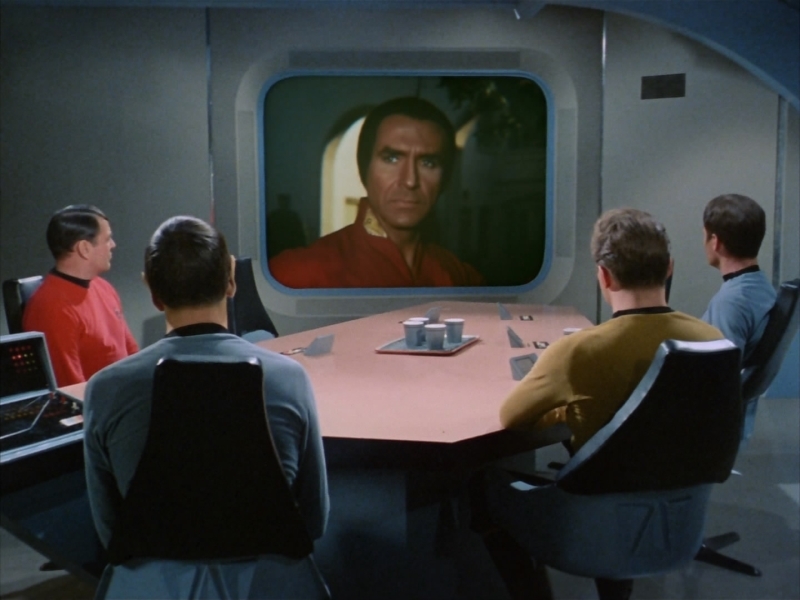 OghmaOsiris: Security contacted Kirk… and then Kirk had to request a security alert?? 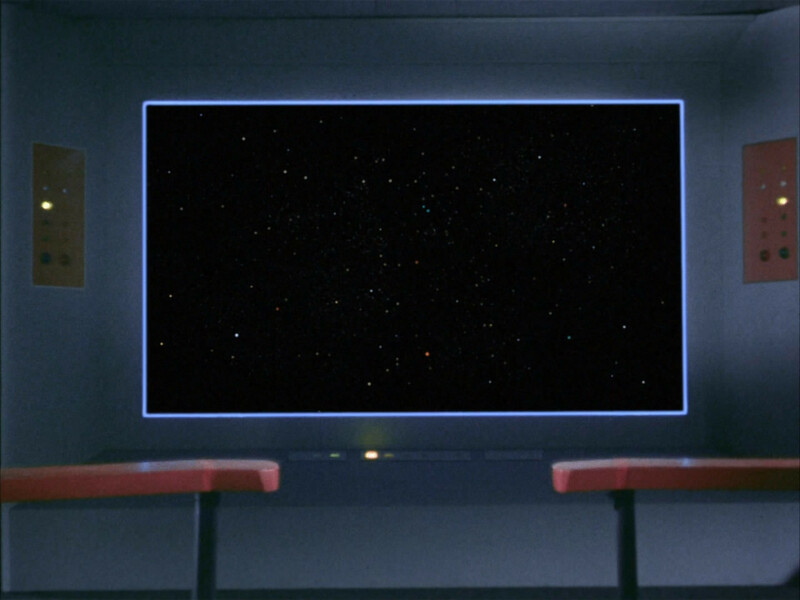 TangoOversway: [Kirk] Spock, you think this has anything to do with me letting him read the tech manuals? 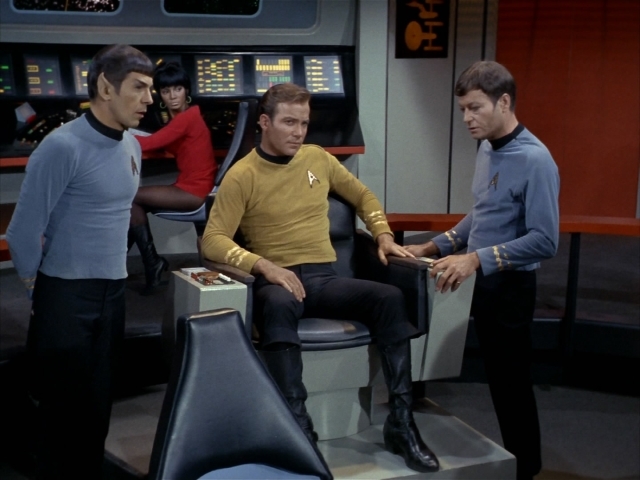 Jack B Nimble: [Spock] I wouldn’t worry about it Captain. TangoOversway: It’s a command decision to call an alert. Jack B Nimble: Self Destruct the ship! Keen: Haha, Spock totally just mocked Kirk for letting Kahn read the tech manuals. Khans troops come back to the Enterprise and begin to take over the ship. KHAN: Nothing ever changes, except man. Your technical accomplishments? Improve a mechanical device and you may double productivity. But improve man and you gain a thousand fold. I am such a man. Join me. I’ll treat you well. I need your training to operate a vessel this complex. Keen: So, Kahn’s an anti-technology luddite? That’s all I got out of his ranting just now. The crew attempts to fight back. Jack B Nimble: The only reason this episode aired was because a white guy hit a black woman. Keen: Oh, now we get back-handed slapping. Where was that guy during the last episode when all those kids needed to be smacked? TangoOversway: I think Uhura looks hot with that hair style. Jack B Nimble: Scotty knocked out an Augment with one punch. Khan captures the entire crew. McGivers has second doubts and frees Kirk. Jack B Nimble: You are such a disappointment, redhead. 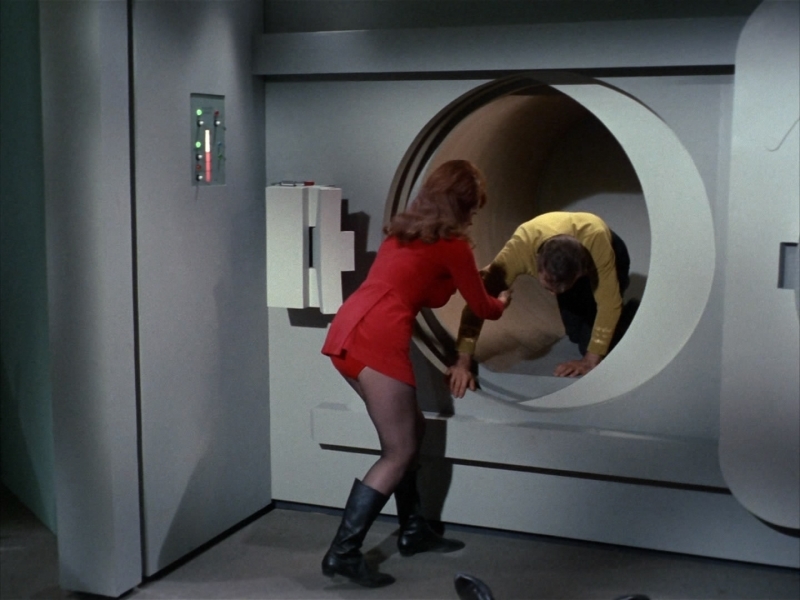 Kirk frees Spock and begins to retake the ship. 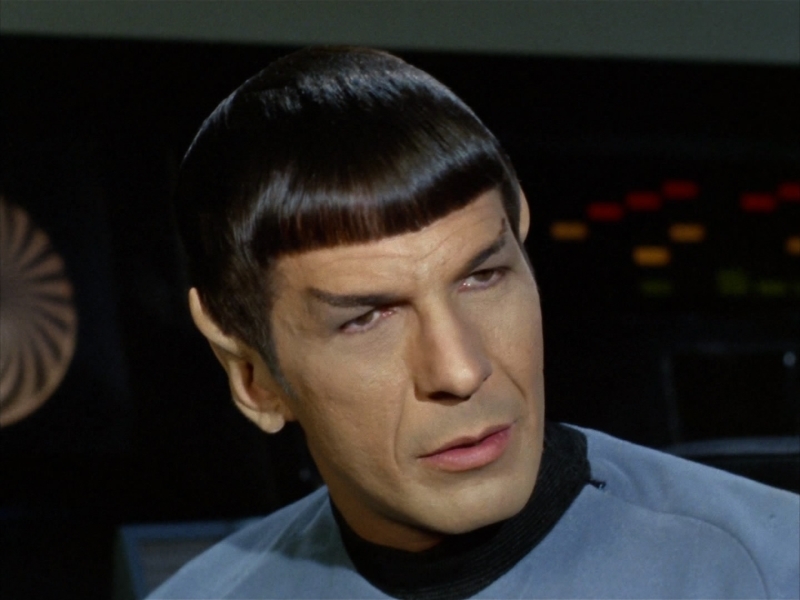 Jack B Nimble: Shouldn’t Spock physically be an equal match for these Augments? TangoOversway: Spock might be an equal for ONE Augment. Keen: That henchman was specifically bred for his superior back-handed slaps. Kirk floods the ship with knockout gas, but Khan escapes. 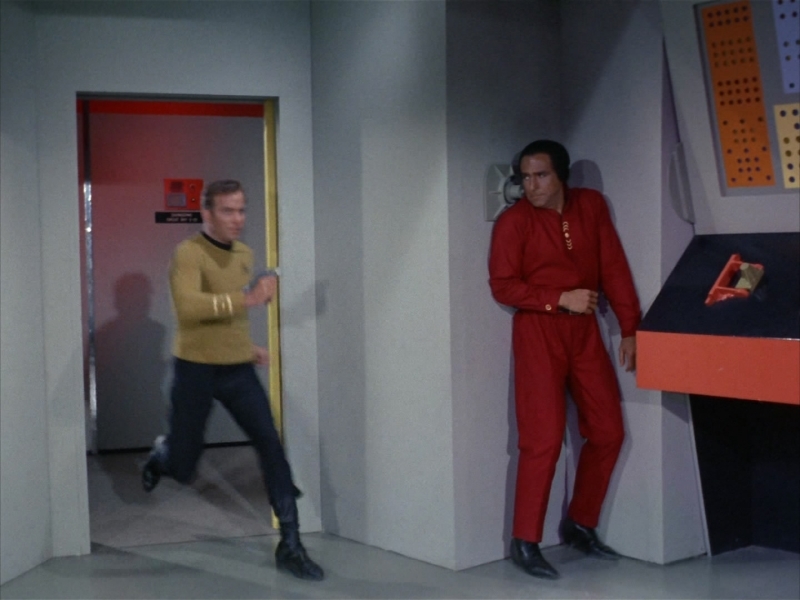 Kirk pursues him. Jack B Nimble: There are too many corners to hide around on this ship. Jack B Nimble: As captain I would remove all hidden corners first thing. TangoOversway: Kirk! That was the oldest trick in the book! 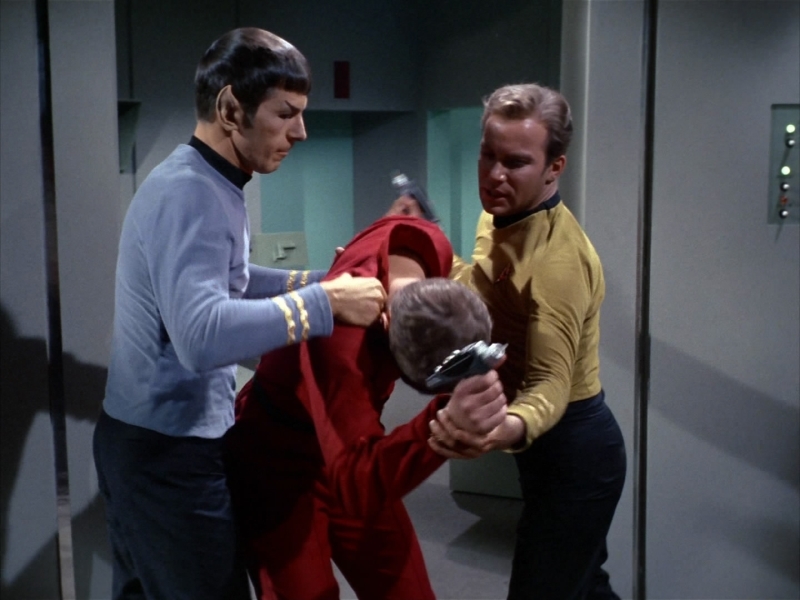 Khan and Kirk’s stunt double engage in hand to hand combat. 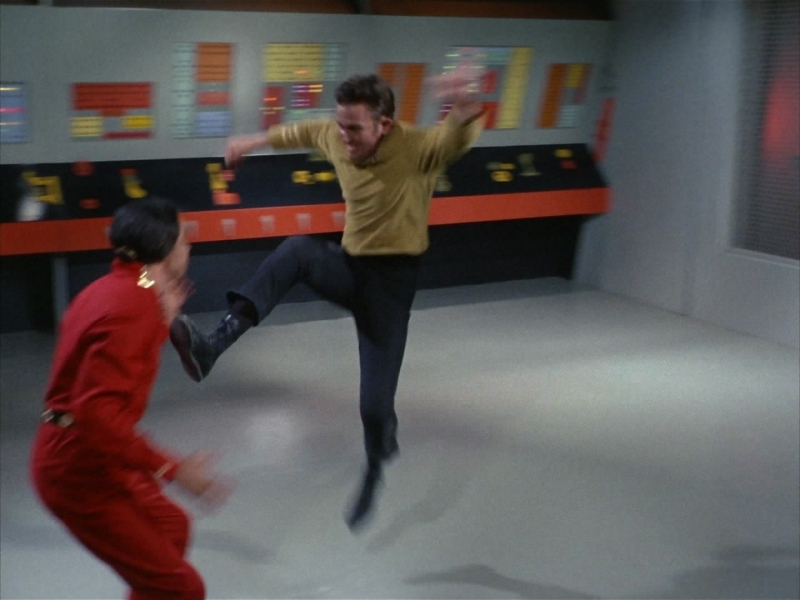 OghmaOsiris: Oooh, Kirk knows karate now. TangoOversway: In this fight, note the cylindrical thingies with handles sticking out from the control panels on the back wall. They’ve never been seen before or since. Keen: Who thought it was a good idea to install a gym in the middle of Engineering? Jack B Nimble: They should have brought Chuck Norris out of cryo to fight Khan. TangoOversway: Chuck Norris doesn’t need Cryo. Kirk is able to overcome Khan and his forces. Jack B Nimble: Why do they keep getting in dress uniforms? 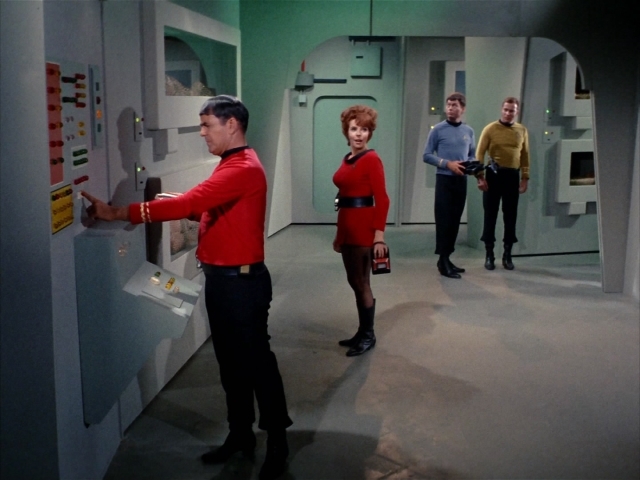 TangoOversway: Scotty’s not wearing his kilt for his dress uniform. 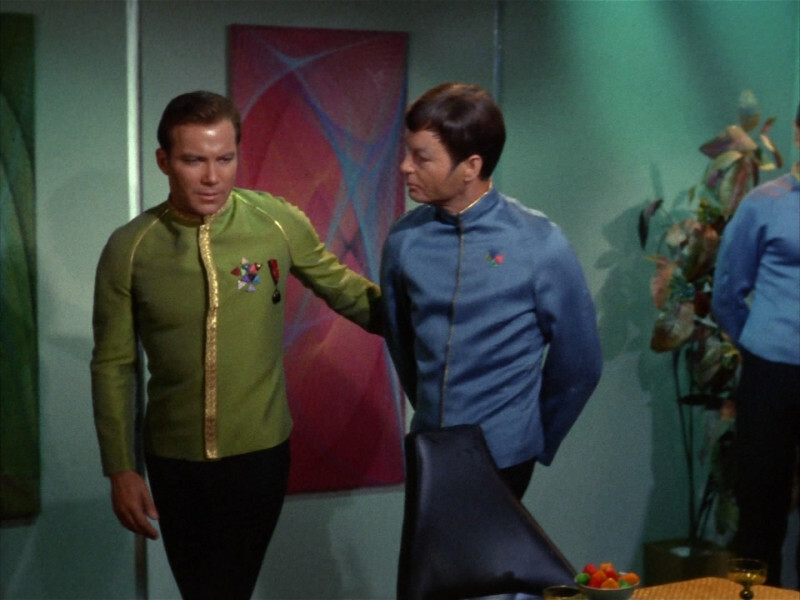 OghmaOsiris: What is that colored thing on Kirk’s vest? Kirk offers Khan the option of starting fresh on an unsettled planet. McGivers chooses to go with him. Jack B Nimble: She doesn’t fit the superior breeding profile. Khan’s children are going to be slow witted. TangoOversway: But she’s cute and has hot legs. Keen: It’s a shame we’ll never hear from Kahn and friends again….. The episode ends on an ominous note. Jack B Nimble: The closing credits have some bizarre stills. Turbo is a film that doesn’t know what kind of movie it wants to be. Is it the type of story where the character isn’t satisfied with their existence and hopes for something more from life (such as A Bug’s Life)? Is it a racing movie where the lead character needs to grow up a little (such as Cars)? Is it a super hero origin movie (such as Spider-Man)? Unfortunately this movie is all three, and it doesn’t do a good job with any of them. Theo / Turbo is a garden snail who happens to live next to the current Indy 500 champion. As such he obsesses and dreams of being a professional racer. After nearly killing himself a few times, trying to prove he is faster than he is, he sets out on a rainy night to get away from his sad slow existence. Eventually he accidently finds himself involved in an illegal drag race. When the driver hits his nitrous oxide Theo / Turbo undergoes a Spider-Man type transformation that turns him into some kind car / snail hybrid. Rather than just making him fast, it also gives him headlights, taillights, a radio, and a backup beeper. From there a series of even more improbable events leads him to have an opportunity to fulfill this dreams. It is somewhat distracting to me that all of the snails can understand English being spoken by humans. From our perspective the snails also speak English, but of course none of the humans can hear or understand them. It is also distracting that once the nature of this special snail is revealed to the public (and the world at large) that the scientific community doesn’t appear to be at all interested in it. Overall this movie was not very good. I remember only thinking a couple of things were funny or clever. I saw this movie at a drive-in theater with a number of children. In general those kids were bored and were more interested in snacks than laughing at the movie. I don’t remember really hearing any laughter at all through the film. So even as a movie just for kids I don’t think it delivers well. It reminds me of Bee Movie, which also felt flat. So in the end this is a movie that is trying to be A Bug’s Life without the diverse bug characters, Cars without the growing up, Spider-Man without the character development, and Bee Movie will all its so called comedy. Maybe there is a demographic who is looking for that kind of movie, but it isn’t adults or children. Warning – This review may contain spoilers or information not immediately obvious from the trailers. Like many people when I read the book I was caught up by the all the stories of before, during, and after the zombie apocalypse. The individual stories, the psychological, political, and societal reactions from the characters brought a feeling of how real and terrible the breakdown of society would be. When I saw the movie I immediately recognized that a lot of that had been taken out in order to create a fast paced action movie. It reminded me of the movie 2012. In that movie you follow a family as they race from one disaster to another trying to escape the destruction of the Earth. World War Z felt very similar. 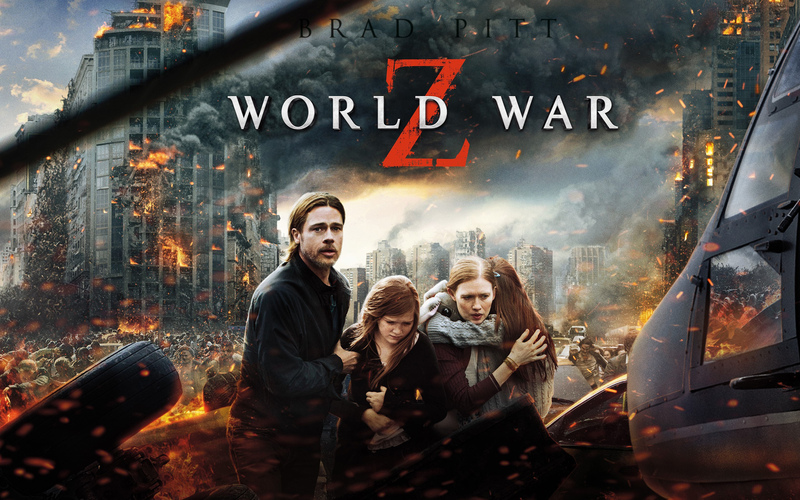 Instead of seeing many accounts across the entire world we follow one man, Gerry Lane (Brad Pitt), and his family while he goes from one disaster to another looking for a solution to the zombie problem. In the book there isn’t a cure (although there are stories around people claiming to have them). Subsequently the book is about survival. When the book ends societies and the Earth as a whole are forever changed because of the apocalypse. In the movie things are obviously going to be different, but I get the feeling not in the same way. Everyone everywhere has been talking about how the movie has nothing in common with the book except for the title. Here are some of the things that are in fact the same. Israel abandons some disputed territories and builds a wall around their protected zones. The initial outbreak area is in East Asia. Major cities fall with people trying to flee to the sea. Here are some things I think the movie does a poor job of explaining or takes too far. From infection to becoming zombified is super fast sometimes and really slow or non-existent other times. Once that stuff is in your blood it shouldn’t take long for it to latch onto your soul. The portrayal of how bad the teeth are in England (it is too horrifying). The zombies working together to overcome barriers. Zombies are attracted to some sounds, but not other sounds (like sounds made by other Zombies). These zombies are apparently smart enough to distinguish sounds by their origin (even when it is a pop can knocked over by a human that ultimately bursts open). The real horror here is the dentistry in England. 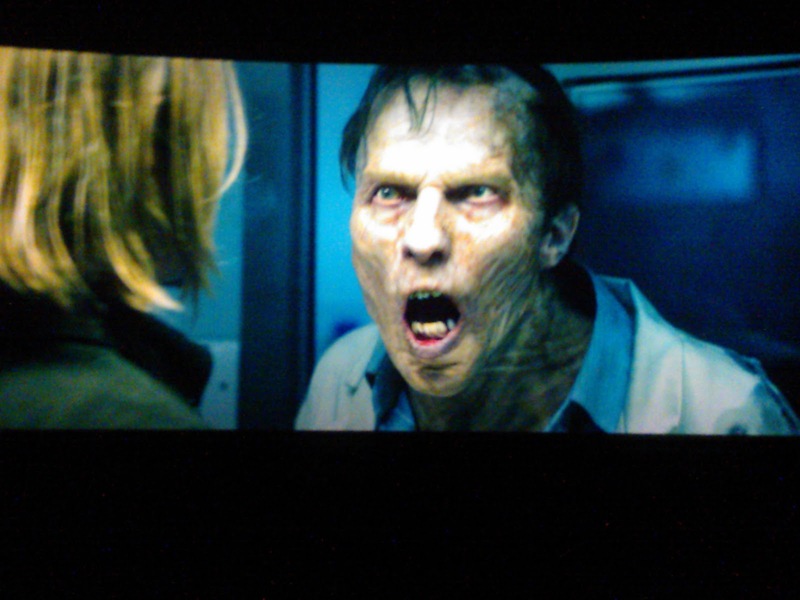 Overall I felt it was a decent enough zombie action movie. The one question both the book and the movie fail to answer is: If these zombies have unlimited energy why doesn’t anyone think to trap them in giant mount wheel that turns a turbine and get unlimited energy forever? You’d just need a guy or two standing behind a secure window to entice the zombies to move towards you. Think people! Think! Averroes asks How did the Death Star manage the debris after exploding a planet? DavRob60 wonders what creative liberties are being taken with the Ender’s Game movie asking Did Mazer Rackham have a tattooed face in Ender’s Game book? Sachin Shekhar wonders Who became Emperor of the Galactic Empire after death of Emperor Palpatine? DVK had the best answer. The most controversial question was Did the Borg follow a Borgesian philosophy? The most viewed question (asked by Logan) by nearly double the runner up was Who is torturing Theon Greyjoy and why? Sidenote, this question, for all its views, only has 2 votes (at the time of this article). The highest voted answer (from Jeff) was Does the death penalty exist in comics? In third place was Was Picard speaking French and being translated the entire time?